Gas up your vehicle, and refill your stock of energy drinks and ammo. It's time for the road trip of a lifetime! Yes, the America of Hit Z Road is one of post-apocalyptic nightmare. But it's also one with a shiny Californian coastline yawning into an ocean that sparkles brightly in the sun at the end of your journey… if you can survive. 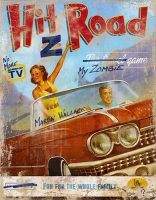 Part survival game, part horror story, Hit Z Road boasts tension and irony in equal measure as you hunt for gas and scavenge for ammo in order to blast through zombies and barrel down the highway to L.A. In the end, though, you don't necessarily have to be faster than the zombies; you just have to be faster than your friends. Add a Review for "Hit Z Road"